Photo of Noah in uniform and with the Chief Defence, General Angus Campbell. 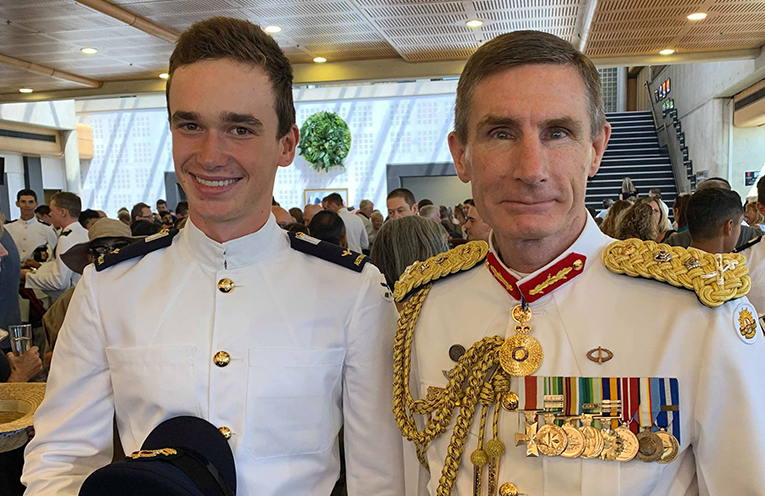 NOAH Davis, 18, a former Year 12 student of St Philip’s Christian College Port Stephens and the school’s Vice Captain (2018), is the proud recipient of The Australian Defence Force Academy Education Award. The Australian Defence Force Academy (ADFA) Education Award is presented annually to Year 12 students in recognition of leadership potential, and academic or sporting achievements exhibited during Year 11. The award comprises an iPad and certificate for Noah, along with a plaque of recognition for the school. There are only 50 awards available across Australia on behalf of the Navy, Army & Air Force, which are presented to suitable applicants who have applied for entry to ADFA. Successful candidates are able to attend ADFA as an Officer Cadet, with the advantages of earning a wage whilst studying, having no HECS debt at the completion of their degree and will be ensure employment in their chosen field after graduation. Noah was accepted into the Royal Australian Air Force to study a Bachelor of Electrical Engineering at Australian Defence Force Academy (ADFA), a campus of the University of NSW. On 23rd February Noah completed his Chief of Defence Force Parade at ADFA, marking his introduction into the Academy. Noah has also been awarded a scholarship by UNSW for his performance in Year 12 – the Academic Achievement Award. Noah received this award for receiving the schools highest ATAR in 2018.